Due to the politics of money, beginning early in the 1980s, during the Reagan era, there was a rapid shift away from private sector employer-based defined benefit pensions to employee-controlled personal retirement accounts. Under President Reagan [1981 – 1989] this trend in the private sector was helped along by the Republican Party that controlled the Senate from 1981 to 1987 giving President Reagan the leverage he needed to shift private sector pension money to the stock market and other risky investments—another part of the Reagan plan besides adding two trillion dollars to the national debt by cutting taxes on the wealthy, raising them on the working class by cutting deductions and spending more. In 1980, approximately 92 percent of private retirement saving contributions went to employer-based plans; 64 percent of these contributions were to defined benefit pension plans [similar to the public pension plans of today]. Then by 1999, [thanks to President Reagan and the Republican majority in the Senate while he was president] about 88 percent of private sector contributions went into defined contribution plans, the vast majority of personal retirement accounts being set up as 401(k)s and Individual Retirement Accounts (IRA). However, the Public Sector did not follow this risky path to retirement. The Public Sector stayed with employer-based defined benefit pension plans such as the one I’m in with CalSTRS. It helped that the union membership rate for public sector workers (36.2 percent) was substantially higher than the rate for private sector workers (6.9 percent). To understand the numbers better and why the media focuses its Yellow Journalism circus act to attract the biggest mob, in November 2011, the Bureau of Labor Statistics reported that there were 20,404,000 public sector employees [2,000,000 work for the federal government—the rest work for the states or local county or city governments] and about 128,000,000 private sector employees. Those numbers help explain why the Associated Press ran Public retirement ages come under greater scrutiny by Don Thompson. If you published a newspaper, a magazine, ran a TV news network, hosted a conservative talk show, or wrote a popular conservative Blog, which audience would you focus on to boost advertising rates? As I said, it’s all in the numbers. During my full-time university days on the GI Bill [1968 – 1973] before I graduated with a BA in journalism, I learned how easy it was for the media to make mistakes while practicing what is known as Yellow Journalism to boost profits. And Yellow journalism [based upon sensationalism and crude exaggeration] is what Associated Press [AP] did when it ran Public retirement ages come under greater scrutiny by Don Thompson on December 14, 2011. That previous quote was in the second paragraph of Thompson’s AP news piece and it is extremely misleading because of what it doesn’t say. How many in public education do you think will earn that kind of money in retirement? What AP doesn’t tell us is that in 2010 the average member-only benefit for retired public school educators in California was $4,256 a month before taxes [less than a third of what Godwin earns in retirement] and that only 16% of educators that retired in 2010 worked as long as Patrick Godwin did. The median years of service was 26.6. For example, if you were one of the educators that retired after 26.6 years of public service [the median] and was only 55 years old [the earliest you may retire and collect], using the CalSTRS retirement calculator, that person would earn about $2,130 a month before taxes—much less than the $14,525.66 that Godwin earns each month. I calculated once that if a public school teacher in California taught for 42 years or more, his annual retirement income would equal what he earned the last year he worked. In public education, less than 4% retire in the 100% category. The reason that AP’s Don Thompson ran with Patrick Godwin’s retirement income as his example is called sensationalism designed to cause an emotional response so people will talk about it. Word of mouth attracts readers and an audience. In addition, Godwin was a school district superintendent at the top of the public education pay scale, which represents about 0.2% of the total. That means 99.8% of public educators in California do not earn as much as Godwin did while working as a school district superintendent. The result is that many readers may believe that most public educators in California will retire with Patrick Godwin’s annual retirement income. However, this is far from the truth since most will not come close, but Thompson’s piece doesn’t say that. The reason AP’s Thompson distorted the facts so much is because of audience share, which determines how much a media source [TV, newspaper, talk show, magazine, Blog, etc] may charge to advertisers, and balancing the news and telling the truth often does not achieve this goal because profits are the foundation of the private sector media. It’s a simple formula: if you don’t make a profit you go out of business and everyone working for you loses his or her job so almost everyone plays the same Yellow Journalism game, and then there is the politics of money. To understand why Thompson wrote such a misleading news piece, it helps to understand the trend away from private-sector pensions that were once similar to current public sector-pensions and the answers are in the numbers. 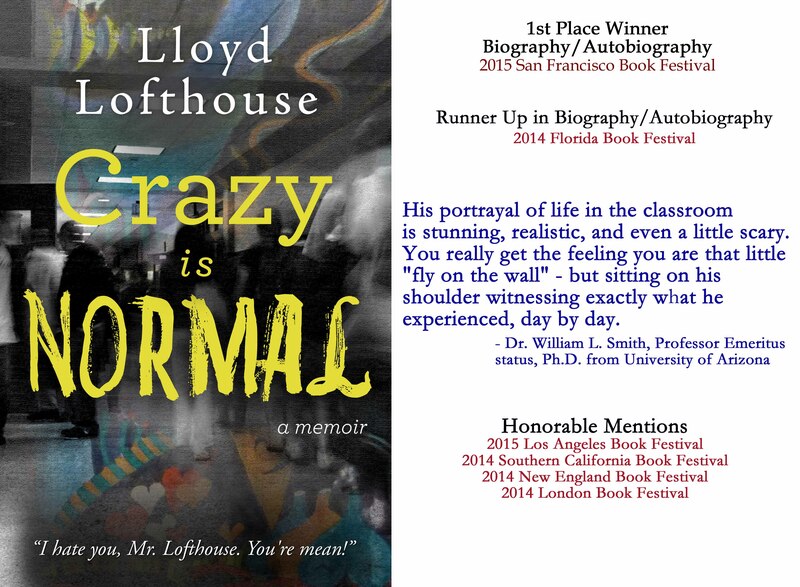 To subscribe to “Crazy Normal”, look for the “E-mail Subscription” link in the top-right column. Dr. Mark J. Perry writes a Blog called Carpe Diem at Blogspot.com. He bills himself as an expert in economics and finances. While his statement and the chart he included with his post may be true, it doesn’t report all the facts and may mislead many who will then blame California’s retired teachers for part of the financial problems in the US. However, I’m one of those teachers that retired after working thirty years in California’s public schools often spending 60 to 100 hours a week ten months each year teaching, planning and correcting student work at school and at home all hours of the week and weekends with no pay during the summer break. In addition, the work didn’t stop when the winter or spring break arrived. Most teachers take work home and spend many days of the three weeks of paid vacation time catching up correcting student work and filling in grades in the grade book. The only time the work stops is during the summer when there was no monthly pay for two full months. In fact, after teaching thirty or more years, most teachers are at the high end of the pay scale making the average pay appear higher for retired teachers, and the retirement amount is based on the average annual earnings of the last three years of teaching. When I retired, the calculation was about 1.95% x 30 (years) = 60.45% times the average of my last three years of earnings. That means I retired with a cut in pay equal to almost 40% of what I was earning my last year in the classroom but it was still higher than a teacher starting out was. That is why when an average is figured for all active teachers, many are at the low end of the pay scale since so many Boomers are retiring and younger Americans are taking their place in the classroom, which lowers the average annual pay for active teachers. In addition, California has the highest population in the country, which means more teachers boost that average retirement number higher since there are more teachers in the equation. When I started teaching full time under contract in the 1970s, I earned about $12,000 annually with medical benefits and paid 8% of my pay into the California State Teachers Retirement System (CALstrs) for the next thirty years with California matching my contribution. Unlike Social Security (SS), which is broke because the federal government spent the SS money workers paid, CALstrs is a retirement fund with more than 130 billion dollars that is invested in the private sector earning a 7% or higher rate of return annually besides the money flowing into the fund from active teachers that are still paying their annual 8% before taxes and the state’s matching funds. The money that pays teacher retirement in California does not come out of the general fund that taxpayers pay into except for those matching dollars. CALstrs reported recently that it is fully funded and has enough money to pay full retirement benefits for the next forty years as long as nothing changes. Unlike Social Security and many other retirement plans across the country, the American taxpayer is not stuck paying for a teacher’s retirement in California. However, I’m sure there are many politicians drooling over those billions of dollars that fund the CALstrs retirement system. California governors have borrowed from CALstrs before to balance the state budget then refused to pay hundreds of millions of dollars back to keep the CALstrs system funded. Then the CALstrs board took the governor and the state to court and won each time so that borrowed money was paid back keeping CALstrs solvent. Although I worked more than ten years (I started working at 15) before I became a teacher in 1975 to 2005, I cannot collect any SS yet I earned it. The federal government calls that double dipping since I collect retirement from CALstrs and California collects Federal dollars to fund parts of its educational system. I also retired without medical as most teachers do in California. Only one or two school district out of hundreds in California offers a medical plan as part of the retirement. The district I worked for did not offer one except for COBRA, which is expensive for the retired teacher and only lasts until the retired teacher qualifies for Medicare. The pay a teacher earns while teaching full time is based on the number of years in the classroom and how many degrees/units one has earned from college/universities. Teachers at the high end of the pay scale in California after thirty years may earn about $75,000 annually while a beginning teacher earns about $38,000 starting out (these were the figures I knew of in 2005). Each school district has its own pay scale negotiated between the local branch of the teachers union and the school board so pay varies between school districts. Rural school districts in California often pay less than urban ones. I suspect that applies to the nation too. Where cost of living is higher, the pay would be higher and real estate in urban areas of California are expensive so the cost of living is higher than most of America. In California, a teacher that retires after 42 years with a Masters Degree will earn 100% of his or her active teaching pay. However, if the teacher retires after 20 years of teaching at age 55, which is the earliest a teacher may collect at a reduced rate, that retirement pay will not even be 40% of the active teacher’s annual earnings.